Join the discussion on our forums! Come discuss Dark Possession over in our dedicated Dark Possession discussion topic. Deal $2 damage to a friendly character. Discover a Demon. 1 mana: upgrade your amethyst spellstone and discover a voidlord. This Spell andStonehill Defender make my Skull of the Man'ari vomits every turn ._. Egg activator, and although a lot of good demons are rotating out with other expansions, it gives Warlock Value and a chance to plan ahead. Nice. Keep in mind that class cards appear 4x as often in Discover than neutral cards. I believe this is the first mixed Discover effect printed where the majority of cards are class cards, which makes the neutrals a pretty rare sight. You can reasonably expect a God or Good tier option. A roll of three Acceptable or Avoids is roughly 12-13% of the time. Being able to just punch yourself in the face for a Demon is pretty good, but you do have to consider that there are plenty of useless demons as well. Doesn't feel like it's worth the card slot. huh... this is a really good card, and the fact you can use it on yourself to trigger the self damaging effects is pretty amazing. looks cute and all but is it really worth the card slot ? Found the tri-annual undervaluing of Discover. At first I thought the card read "1 mana, deal 2 damage to a friendly minion, discover a demon" and thought to myself, "hey thats pretty good". However, after reading it again and in how you can just poke yourself and draw a demon, this card is very good. It might clash a bit with Bloodreaver Guldan if you get a bad demon, but then just don't play it. The card lets you kill your Possessed Lackeys so you can save your Dark Pact for cubes/big things. This card will see play, simply just as another sacrifice outlet. And it cost 1 mana. Which you have synergies for (skull and Guldan and lucky). So yeah, I guess it's very good. 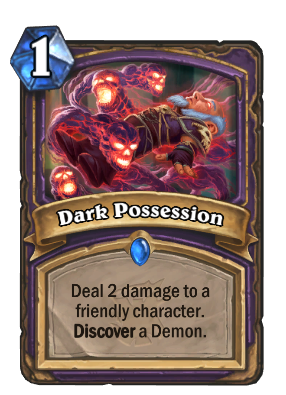 I could definitely see a world where Voodoo Doll, Possessed Lackey, and Carnivorous Cube are all run as doubles and are more consistently killable from running doubles of both this and Dark Pact. Moar Skull value and moar upgrades to Lesser Amethyst Spellstone. Lets goooo. Yes, and this targets a friendly CHARACTER, not minion. Finally a discover demon card! Should be pretty versatile. For sure. Mistress of Mixtures is rotating out, this can slide right in.